Tank 7 Farmhouse Ale | Boulevard Brewing Co.
A: Pours a hazy medium yellow in color with moderate to significant amounts of visible carbonation along with some lemon yellow highlights. The beer has a four finger tall fluffy foamy off-white head that slowly reduces to a dense finger tall cap in the center with a half finger thick layer covering the remainder of the surface of the beer. Significant amounts of lacing are observed. S: Moderate to strong aromas of spicy (peppery) yeast along with moderate notes of lemon citrus and some biscuit + pale malts. Light to moderate amounts of herbal and earthy hops as well. T: Upfront there is a moderate to strong flavor of biscuit and pale malts that gives a slightly hay-like taste with light to moderate notes of lemon citrus. There are moderate flavors of spicy/peppery yeast along with some herbal + earthy hops which impart just a touch of bitterness. M: Just shy of medium bodied with moderate amounts of carbonation. Crisp with light to moderate amounts of dryness in the finish. O: This is a very nice Saison and one that I would gladly drink over and over again. Wonderful flavors and very easy to drink + refreshing - the alcohol is well hidden. One of the best examples of the American take on a traditional saison. Tank 7 is definately a modern take on a traditional Belgian Farmhouse. Because of aggressive phenolic character and high hopping rates, this beer shows a lot of layering. Tank 7 pours with a medium golden hue and haziness that makes it look like a Witbier. A froathy and airy white head has great retention and lacing. A very solid appearance. Mouthwatering aromas of citrus, vinous, American hops, and a peppery twang. The malt character gives a slight sweet scent with low grain character. True pilsner malts give a soft confectionate sweetness and a pleasant grain flavor. The malts only act as a springboard for the more powerfull flavors of sharp, bitter, and citrus hops by contributing flavors of lemon, orange, grapefruit, and pineapple. Esters exacerbate the fruity hops with apples, under-rippened berries, lemons, and white grapes. Not stopping there, the yeast gives a lot of phenolic (almost plastic or medicinal) at times and perhaps a light soapy note. All these flavors layer upon themselves allowing for new flavors to be explored in every sip. Creamy and soft up front but the beers bitterness, light astringency, and acidity builds and breaks down the beer's texture, allowing for a palate cleansing and refreshing finish. A minty note rises in the finish and aftertaste, giving a tea-like taste. Tank 7 is a remarkable beer that belongs with the experimental Belgian IPA's. And, it's certainly better than most. You will see as my reviews add up over time that I love FARMHOUSE ales. I tell a story to my customers about learning to taste coffee to my first experience from college drinking to my first great bottle of beer. That bottle that changed my expectations of beer was Saison Dupont. That all being said, this is the best American Farmhouse beer I have ever had. Thank you Boulevard Brewing Co. Poured from a 12 oz bottle dated (BB June 17,2017),into a large Funky Buddha snifter.Cap says smokestack series. Frothy,white head,that stands 2 fingers tall.Hazy light gold in color,with distorted light showing through the glass.Lots of small sediment floating around in the body.Little to no carbonation. On the nose I get bright citrus notes,sweet bread,yeast,pepper,and lemon grass.This beer smells wonderful! On the palate I get citrus,sweet bread,yeast,and lemongrass on the front end.This is followed by some pepper and sweet malt on the back end.A little nit of a sourness after the other flavors fade away,but nothing offensive.Very nice taste to it too. The body is thin,with a dry finish that packs a small punch. This is my first farmhouse ale,and I have to say I really enjoyed it.I paired it with a very good lemon / almond cake,and it paired beautifully.I'll have to try some of the Prairie Artisan Ales farmhouse ales in the future.Very nice. This is my favorite beer in the country, and I travel for a living. Other competitors would be a few "Big Eddie" recipes, Kentucky Ale, and on a hot summer day, or a ball game, Sunlight Cream Ale from Sun King Brewery. Tank 7 is NOT your typical over-hopped fad beer. Don't let the light color lull you into a false sense of security though. It's a very balanced, but powerful brew. Enjoy! This has to be one of my all time favorite beers. Anytime I see it I have to get at least a glass of it. It is a well balanced farmhouse ale. It is just funky enough, just sour enough, just malty enough. Nothing over the top. Just easy drinking with great nose and flavor. On tap at the Fallen Rock. A huge head, yellow body. Pleasant aromas and a nice bitterness. Served a bit cold, on a freezing night. Belgian yeast, the beverage seems more to me as a Belgian IPA, with some lemon and grapefruit and other nice fruit. Nothing overt. L: Comes in a clear gold color that becomes immensely hazy, almost opaque, once the yeast is added. The head is huge, frothy, creamy white and lasting. Retention is almost perfect; eventually subsiding somewhat, but leaving a big white bubbly pillow. Lacing is left in sheets, of course, as is expected. Marvelous looking beer. S: Lots of sweet, overripe banana; more like Runt's banana candy than actual banana. Some clove and peppery spice. Big biscuity malt backbone. Vanilla creaminess, and a cantaloupe and honeydew melon fruit presence that freshens it up and livens it out, along with touches of orange and grapefruit; and a slight oakiness. T: Huge cantaloupe and honeydew melon upfront, along with touches of green and white grapes, and passion fruit. The banana candy is there to sweeten things but its a bit more in the background than the aroma. There's a touch of sugar-coated, candied orange and grapefruit peel. There's a big crackery and biscuit malt presence, but it's hardly sweet at all. It's more like a pillowy, doughy sensation. Just a touch of warmth going down, but alcohol is very well hidden. Finishes quite dry--but not bone dry thanks to the fruity flavors. There's some pink bubblegum, and then ends with an herbal note (sort of like either cilantro or rosemary; will update if I find out) and then a whole mess of clove. F: Medium-full, well-carbonated, smooth and slick across the palate, and lightly creamy. The finish is dry, and between the dryness and carbonation this is stupidly easy to drink. O: Wow. Is this the best American traditional-style saison? I don't know, but it is fantastic. This is a wonderful beer. Nice medium gold beer covered in a foamy white head that leaves ribbons of lacing. There is the aroma of banana, clove, cherries, and Belgian yeast. The taste is sweet with massive amounts of banana and clove with a bit of fruitiness in there as well. There is a yeasty taste that ends with a peppery and bitter finish. I love this beer. It is really Belgian with a bit of an American twist. Pours a medium golden color. Smell is sweet citrus and lemon. Tart citrus start. Then some fruity esters. Slightly earthy. Pours with a gorgeous, sudsy huge extra fluffy pillow of head. Pale straw in color and lots of haze and cloudiness. Aromas are funky, grassy, herbal, old hay, and some barnyard. Everything you expect from a good saison, but with more spiciness and a hint of citrus. Flavors are classic and spot on for belgian saison, but again with a bit more spiciness and some fruit. Quite a lot of hop bitterness for the style, which along with the other traits makes for some real bit. Finish is a bit like preserved lemon. Light mouthfeel with a medium body and some gripping character due to the hops. Beautiful farmhouse beer. Easy drinking, funky, refreshing, with a bit of twang on the back end. Best by 8/27/15. 12oz bottle poured into a tulip. Pours a beautiful shiny golden; fluffy eggshell white head that sticks around leaving great retention and sticky lacing. Bubbles are constantly swimming to the top. Very nice aromas. I'm picking up some grapefruit and lemon. There's a subtle hop aroma. Yeast notes are there. Some spices. The aromas have a nice sweetness going on. Flavors are sharp and crisp. Very vibrant. More citrus notes. Some banana. Clove and coriander is in the mix. Subtle black pepper notes. Some grass and subtle pine notes. Floral notes too. Finishes clean dry with a subtle hop bite. Mouthfeel is great. It's full-bodied with active carbonation. Very creamy and fluffy. Very smooth. Alcohol goes unnoticed. Fun to drink. This is a great brew. Boulevard really seems to know what they're doing with these styles. Well executed. Recommended. I picked up a bottle of Boulevard's Tank 7 Farmhouse Ale last week for $2.89 at The Lager Mill. I've been wanting to try this one for a while and not that it's in Michigan I have my chance to see if it lives up to it's reputation, so lets see how it goes. 2016 Vintage. Poured from a brown 12oz bottle into a teku. A- The label looks nice, it has a clean and classic look to it and it's just a little eye catching. It poured a hazy orange color that takes on more of a golden color when held to the light with over three fingers worth of fluffy and chunky off white head that died down to a thick ring that stayed till the end and it left lots of patchy lacing behind. This is fantastic looking beer, this is just how a good saison or farmhouse ale should look. S- The aroma start off with a higher amount of medium yeast with a big fruity aroma being the first to show up and they impart a big stonefruit, citrus rind and pineapple like aromas and that leads into the yeast which impart a a little bit of bubble gum aroma with a typical saison yeast like aroma along with a little bit more juicy and bright fruit aromas and a slight bit of pale malts and a grassy aromas showing up towards the end. This beer has a good aroma, I like the fruitiness, but I wish it had a little funk to it. T- The taste seems to be Similar to the aroma, but lighter and it starts off with a medium amount of sweetness with that same fruity aspects that I got int the aroma being the first to show up and this time taste takes on a little more of that stone fruit like aspect and it's followed by the yeast which is a little lighter and imparts a typical saison yeast flavor with no bubblegum this time. Up next comes some hops which impart a slight citrus rind and grassy flavors with a slight bit of herbal hops which impart a higher amount of low bitterness with a saison yast and stone fruit aftertaste and just a little bit of those malty flavors show up. This is a good tasting beer, no flavors are to overpowering, but I still wish it had some funk to it. M- Smooth, slightly refreshing, a little crisp, medium bodied with a slightly higher amount of medium carbonation. The mouthfeel is good and works well with this beer. Overall I thought this was a good beer and goos example of a Saison, it had just about everything that i look for in the style and the balanced seem to be right in line with the drinkability. This beer had good drinkability, I could have a couple of these, especially on a warm day. What I like the most about this beer is the balance, no single flavor is too overpowering. What I like the least about this beer is that it's labeled as a Saison, maybe it's because I'm so use to Jolly Pumpkins Farmhouse Ales that I always expect a little funk in there, to me that's what sets apaprt a regular saison from a Farmhouse ale and I wish it was labeled as a Saison. I would buy this beer again when looking for a good saison and I would recommend it to anyone who likes the style. Good job guys, this is a tasty Saison. A: 4 finger head, funny, the carbonation on the bottom is a perfect circle floating to the top. The head goes down quickly. Nice mellow golden color. S: Citrus aroma, slightly mettallic, grapefruit. T: Bitter, bitter, bitter! Hoppy with some grapefruit and other citrus. The bitter taste stays with you as you drink it. Gets more bitter as you drink on. M: great carbonation, good feel. O: I was so disappointed in this beer. I was really bitter and just kept getting more and more bitter as I drank it. The grapefruit is nice and refreshing, but the hoppy, bitterness overwhelms any other tones within the beer. I will not be buying this beer again. L- Pours a frothy two finger thick head. Clear/straw/amber colored beer. Oh wait... is that some yeast that I see? Yep. Kind of makes it look like bubble tea. S- Sweet, fruity, yeasty aroma admits from this beer. Honey? Maybe. The yeast meshes well with the fruity hoppyness. Great smelling beer. T- Taste is sweet and continues to be sweet for a while after sipping. I also pick up a certain spiciness, followed by some bitterness from the hops. O- I picked this up in Mobile, Alabama. So I'm pretty sure you can pick it up anywhere. Very interesting beer, little to no tartness that is usually expected in a farmhouse ales, but that is completely okay because this is a fine brew. With that being said this beer is a sipping beer, if you get it, take it one beer at a time. Smell: Nice aroma, bready, yeasty, yummy. Overall: Really enjoyed this beer… Will buy when available.. I was actually surprised how close this comes to the Saison Dupont. A really great Saison with an american hoppy kick. I'm finally getting a chance to try this beer. Boulevard just recently made their appearance back into Tennessee and I'm very glad they did. I missed this one the first time around. this one hits all of the right notes for a traditional Belgian Farmhouse ale. that being said, it also brings a Slight bitterness to the game that I find rather appealing. Slightly less funky than many of its counterparts, the twist is rather nice and for a beer that I will be able to grab off of the shelf regularly, I am going to purchase this early and often. pours a thick straw golden color with a fading lace head into a snifter. would never guess this to be 8%. smells yeasty and fully fruity. taste is robust ripe sweet full flavored fruit. plums, apples, berries, all blooming in the mouth. yeast backbone and a hop presence in the middle. problem with this one is the mouthfeel. way way too heavy and filling for the style, i should be able to session this. as filling as my bbq ribs i ate with this. heavy feeling bust still properly carbonated. i liked it, but as with many of boulevard's beers, there are 50 better alternatives per style. 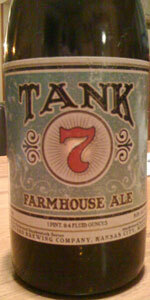 Tank 7 is a nice way to get people into farmhouse ales. It's not too funky, has a hoppy flavor which will help acclimatize those who have not yet ventured past IPAs, and has a pleasant dry grapefruit taste. Nice complex taste for a mid-low IBU beer. The combination of citrus & spice gives a very nice zing. The finish lasts long enough to complement a meal. This is supposed to be paired with pork or chicken, but I found it to pair nicely with a blue-cheese-avocado-bacon-burger. 12 oz. bottle from a 4-pack picked up at the LCBO; best before Apr 22 2016 and served well-chilled. Pours a foggy golden-yellow colour, causing nearly two inches of fluffy, resilient white foam to erupt from the surface. It fades unevenly - more quickly at the edge of the glass than the centre - leaving behind a mesa-like formation in the middle while the head dissipates in a long, drawn-out process exceeding ten minutes. The glass becomes caked with an arching pattern of soapy lace - this is just a flat-out gorgeous beer. On the nose I am getting a lot of citrusy lemonpeel, with accents of orchard fruit, floral hops and grainy pale malts. Yeasty and spicy, with touches of white pepper and coriander. An all around enticing aroma. Very tasty stuff, with virtually no sign of the 8.5% alcohol whatsoever. Grainy pale malts act as a neutral backdrop for the flavour profile, which first features a fruity ensemble of apricot, pears and apple, with hints of orange and bubblegum. The citrus flavour remains strong through to the finish, though it becomes pithier and more grapefruit-like, and finally a bit earthy as the yeast moves in to dominate. It ends with a nice burst of spicy white pepper, leaving behind a dry aftertaste. On the fuller side of medium-bodied, with prickly carbonation that weakens considerably as you sip your way onward, making the mouthfeel increasingly smooth as it warms to room temperature. Dangerously drinkable, given the well-masked alcohol content, and overall deliciousness. Tank 7 Farmhouse Ale is a seriously good saison that blows a lot of the locally-made equivalents out of the water - making it a much-needed addition to the Ontario beer scene. I'd feel pretty safe recommending this to any fan of Belgian-style pale or farmhouse ales. This is my last bottle, and even though the "best by" date is less than a week out, it tastes just as good as I remember. A must-try that will hopefully return to Ontario in the future. Final Grade: 4.37, an A grade. This is the perfect Saison. This beer made Boulevard one of my favorite breweries. Tank 7 Farmhouse Ale from Boulevard Brewing Co.